Since Christmas 2013 is all about a Christmas Noir theme, I decided to stick with it and make the wreath a Christmas Noir cookie wreath, using the same sort of colours Wheel and Barrow did, but having the wreath black instead of red and white. 1. Flatten the cardboard box out on a hard surface and place the large plate in the centre. Use a text to draw around the outside. Remove the plate and place the bowl in the centre of the circle you just drew. Use the text and draw around the outside of this bowl. 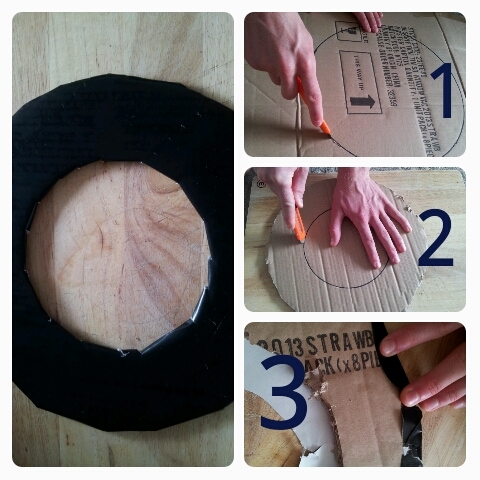 When you remove the bowl, you should have two circles drawn on the cardboard – one inside and one outside. 2. Use the box cutters or scissors and cut the two circles out, leaving you with a large circle with a hole in the middle (where the bowl was drawn). 3. Spread your spare wrapping paper over the whole circle and cut it down to size, just so there is one or two centimetres of wrapping paper larger than the outside part of the largest circle. Cut an inside circle as well, leaving a little bit of extra wrapping paper on the sides. 4. Fold the extra wrapping paper over the cardboard and use sticky tape or glue to hold it in place. Do this on all sides of the circle, including the smaller inner circle. 5. Make sure everything is stuck firmly in place. When you flip the circle around you should have a fully covered wreath. Now please note you are welcome to make a wreath using any sort of material you wish, it’s just using the leftover wrapping paper was easiest for me. 1. Heat the honey to 65 degrees (we used a candy thermometer) and transfer to a mixing bowl. 2. Add the butter and mix using an electric beater. 3. Add the sugar, flour, egg and mixed spice and mix together with a wooden spoon to get a dough consistency. 4. Dissolve the bicarb soda in the water and add to the dough, mixing it all together. 5. Roll the dough into a bowl and leave it covered with a tea towel for half an hour. While it’s setting, preheat the oven to 180 degrees celsius. 6. 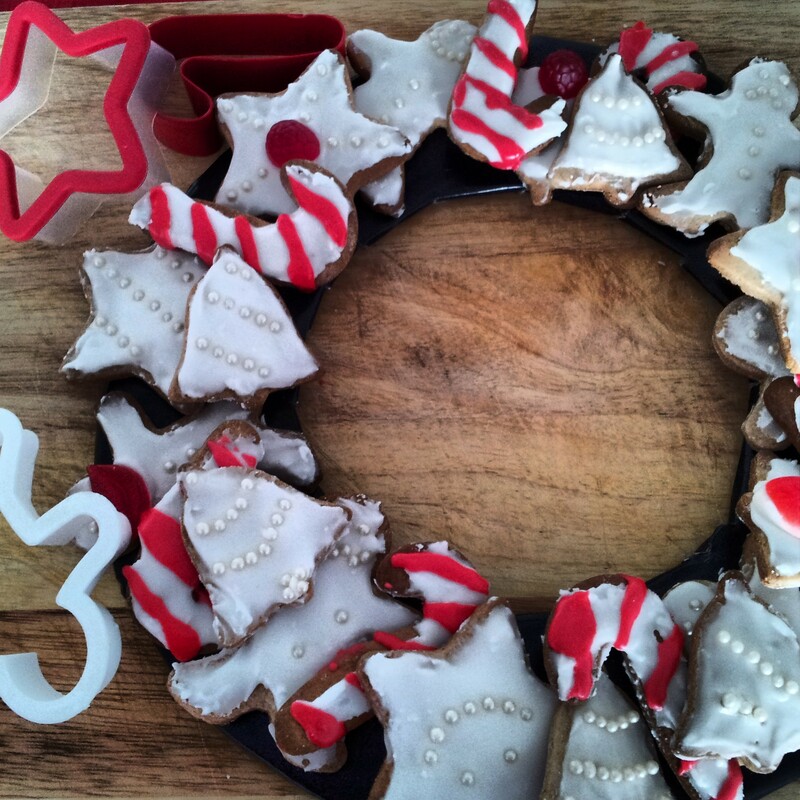 Roll out to 4 – 5mm thick and cut into the desired shapes for your cookie wreath. 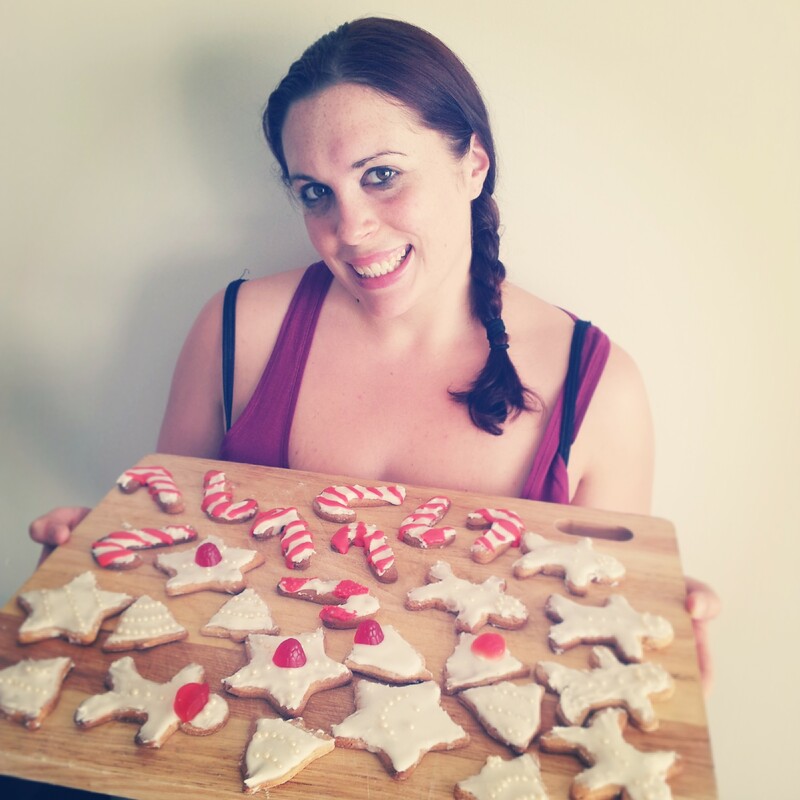 We used cookie cutters in the shape of bells, little men, stars and candy canes. You can even go a bit macabre or funky if you want and get a series of gingerbread cutters in skeleton or ninja shapes, just to add a bit of fun to your wreath! Once your done cutting them out, set them on a tray lined with baking paper. 7. 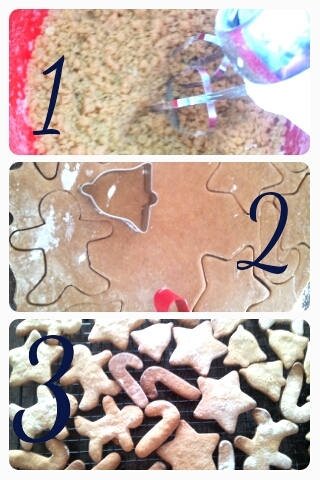 Bake the gingerbread cookies in the oven for 10 – 12 minutes or until golden brown. Remove the cookies and place on a cooling rack to cool completely (I normally have trouble with the waiting til cool part!). 8. Next, you can ice the cookies one of two ways (or no way, if you would prefer!) You can use fondant and roll it out on a board, cut the shapes in the fondant and then stick to the gingerbread cookie with sugar syrup. You can also ice the cookies the way I did, which was a lot harder. We used Royal Icing, which hardens after awhile, and we basically painted it on the cookies and used a spatula or flat knife to neaten up and clean the edges. Either way you do it, the cookies will look and taste great so it doesn’t really matter! 9. Next comes the fun part – the decorating! Decorate until your heart’s content! We used white sugar pearls, red gummy candies and red Royal Icing for the candy canes, but you can use hundreds and thousands, icing piped on the cookies, little stars, anything! Be as creative as possible! And now you have your cookies! I designed my Gingerbread Wreath to be a flat wreath laid down on the dessert table, so I set up the plate for it to be on (a rustic style chopping board) and laid the wreath on top of it. Instead of sticking the gingerbread men to the wreath, I piled them on top in a neat arrangement and left them for the family to pick away at. They were quite a Christmas treat!